Summary:Full information on glyphs and their runes available at the station AND on the road! Quick selection by desired glyph type, level and quality and one-click creation. Batch extraction available for inventory and/or bank. Localization in German and French available. Feature rich - check it out, if you haven't and check again if you haven't used it in a long time - a lot of features have been added continuously. Zusammenfassung:Volle Information über Glyphen und ihre Runen am Handwerkstisch UND unterwegs. Schnelle Auswahl des gewünschten Ergebnisses anhand Typ, Stufe und Qualität.Verwertung von Glyphen in der Bank und/oder Inventar in einem Rutsch. Reich an Featuren - probier es aus, auch wenn Du es in der Vergangenheit schon einmal probiert hast. Es hat viele Updates in der vergangenen Zeit gegeben. Résumé: Créer et détruisez les glyphes rapidement. Sélectionner un glyphe sur la liste ordonée et cliquer pour placer les runes sur l'établis d'enchantement - prêt à fabriquer. Scannez partout le matériel qui vous permet de fabriquer des glyphes. respecting FCO Item Saver - use option "FCO Item Saver Mark" if you want the lock sign set on a glyph be enough to protect it. Default is that you have to filter the glyphs out (green lock symbol on extraction panel). Die Zeilenhöhe, bzw. die Breite und Höhe des Fensters kann über die Einstellungen angepasst werden. Die letzte Position des Fensters kann optional automatisch gespeichert werden. FCO Item Saver - Benutzer Option "FCO Item Saver Mark", wenn ein gesetztes Schloss ausreichender Schutz sein soll. Ansonsten müssen die zu schützenden Glyphen mit dem Schloss aus dem Verwertungsbogen gefiltert werden. Glyphen können markiert werden - Häkchen rechts neben dem Glyph bzw. den Bereich dort anklicken. Naviguer dans la liste rapidement soit en utilisant les flêches haut/bas ou la barette coulissante. - fix for current API - thanks to votan! 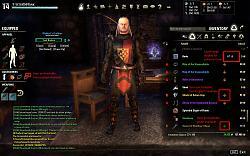 - add button for using the addon's master data, which gives you a list of 1870 glyphs. For that you have to copy the master file to QuickEnchanterMaster.lua. Since it is 1.8 MB big, it is not inserted by default. You still have to use the ban-sign button to display glyphs that you don't have the runes for yet. 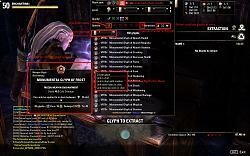 - add option "Center Tooltips". If on (by default), the tooltip for each glyph is display at the same center position. - FCO Item Saver: If filtered out, glyphs are not getting extracted. If option "FCO Item Saver Mark Used" is turned on, setting a lock is enough to protected a glyph. - add new default option radio button, which makes quality and glyph type selection exclusive i.e. only one quality and only one type. Go to settings, if you prefer the old behaviour. 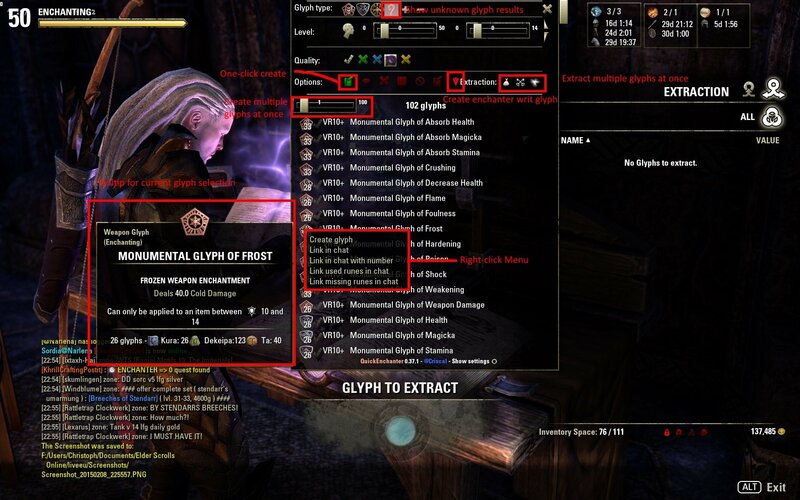 - add buttons for destroying glyphs while at the crafting station - uses information provided by FCOItemsaver in order to protect locked items. - fix setting "best quality only"
- Add support for languages (not all texts of the settings menu is getting translated on the spot - please reload the UI). Looking for a translation into french as well. ...this addon appears to be entirely broken as of the present moment. I have had the same experience. And likewise, I have not found a satisfactory alternative. Even slightly broken, it works the best. 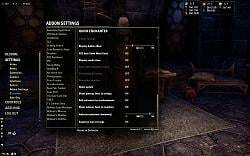 any other enchanting addons works atm? I've experienced the same behavior since I started using this addon, around January. Have to keep the option to start at character's level off. However, I have not found any other enchanting addons that I like nearly enough to make me switch. I believe CraftStore has an enchanting component, but I much prefer Quick Enchanter. 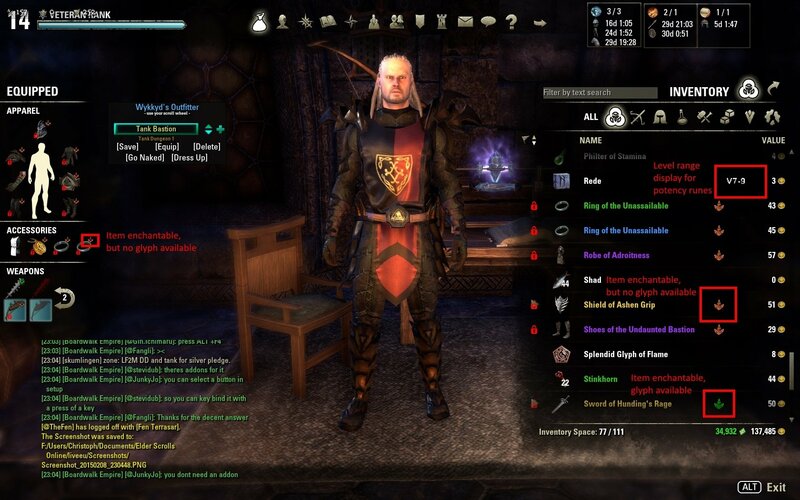 I'd love to see an update addressing the various (rather minor) issues Quick Enchanter has, but am happy to overlook the few features that aren't working in order to use the great ones that are. If the author, (or anyone else who decides to take up this addon,) would like, I'm happy to provide a list of the issues I've noticed. Thanks to the author/maintainer(s) who made and keep this addon going, (such as Votan, the author of LibEnchantingStation)!! Last edited by RavenMind : 08/26/18 at 01:19 AM. Last edited by Marazota : 07/18/18 at 12:16 PM. There is no reason for the regression. I will pack up libaddonmenu as soon as possible. errr is there any reason for the libaddonmenu to regress to the version 20 when the actual uptodate version is 26 ? is this new version for everyone or only for those having problems ? I am asking because i have absolutely zero problems with the 0.44 version (probably because i only use the the main version of Advance fllters and none of the adds for it). So is there something i need to have from this new version ? votan provided updated libraries for making QuickEnchanter work again. Thanks a lot to him! Just FYI, still getting the Advanced Filters LUA errors at the enchant station. It seemed to work with your AF "beta", but at some point, maybe after AF got officially updated, I started getting the errors again. I did try overwriting the QuickEnchanterMaster.lua file with the FOR_USE_COPY_OVER_QuickEnchanterMaster.lua file included in the archive. Still receiving errors. I'll try rolling back AF to your version & see if it still happens. 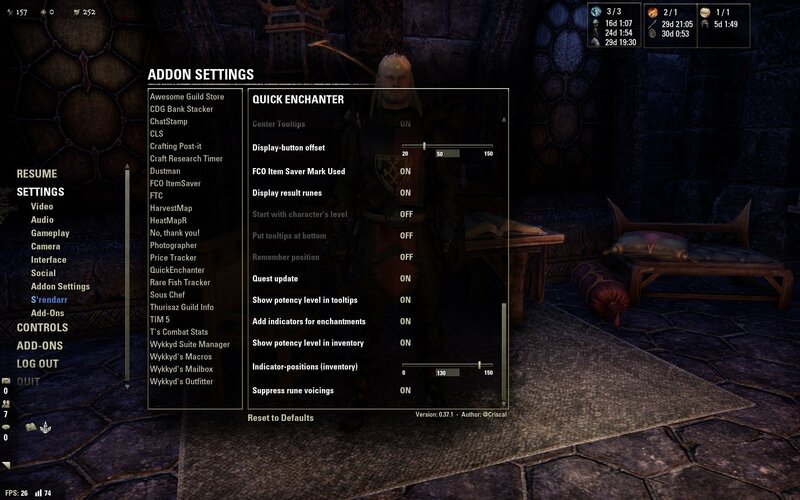 Edit: Rolling AF back to Baertram's "beta" version of Advanced Filters no longer causes LUA errors at the Enchanting station when using Quick Enchanter. However, the current updated version of AF, does cause the LUA errors to pop. Last edited by RavenMind : 06/10/18 at 06:28 AM. QuickEnchanter is somehow overwriting functions and hooks which damages other addons, or makes them non-functional. Not sure if it works. All work done by Votan! Thank you Votan for the fix & Baetram for making it available! I'll give it a whirl & report back! I did actually look for LibEnchantingStation. I could have sworn I'd seen it on here before & thought it was one of Votans, but was not able to find it. Looks like that was what was updated, plus an API bump in the .txt? Very nice, thanks again! Last edited by RavenMind : 06/03/18 at 02:47 PM. It appears that this addon overrides FCO CraftFilter's bank vs bag filter in the extraction menu. FCO's icon for it does not show up when this addon is active. That did the trick and now the UI still continues to work after extracting all glyphs! You have eclipsed my expectations of having to switch addons. I don't know how to express it, but I am very thankful for the update! Has anyone found a good replacement that has a similar layout and functionality? I've tried a few here on the site but nothing that really felt like Quick Enchanter. I'm planning to update FCOIS soon with a major new version. Some function names changed and I'm trying to give the developers of other addons that support FCOIS the source code in order to make it work for now AND after the new update. If you still support this addon please put it into your next update, thanks.